In the heart of Wan Chai sits an unremarkable playground flanked by towering high-rises and a set of low-hanging LED signs beckoning bar revellers. The hum of the metropolis can be heard under the sound of basketballs bouncing off of the floor, as children run around soaking up the last bit of sun for the day. But the playground, discreetly tucked into the side of Lockhart Road, has become an unlikely site of conflict over open space – an ongoing problem endemic to this densely populated city of over 7 million residents. Lockhart Road Playground, Wan Chai. Photo: Jennifer Creery/HKFP. 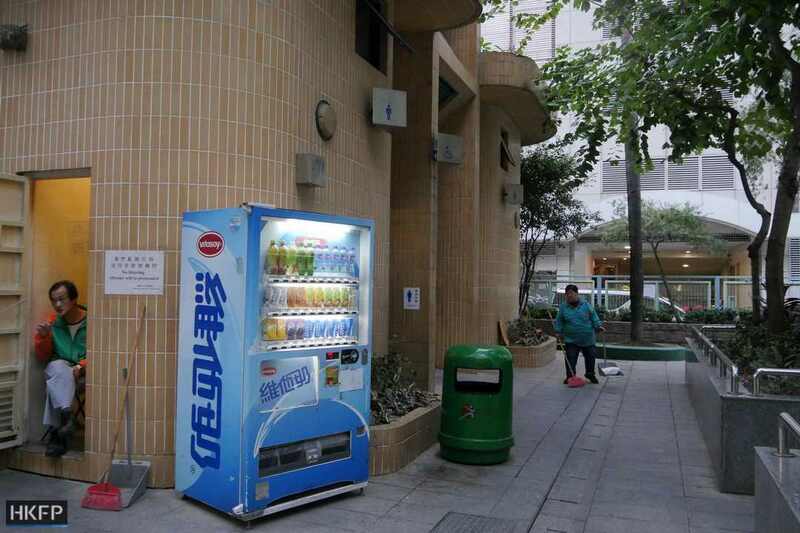 In 2014, the Water Supplies Department (WSD) submitted a proposal to relocate a fresh water pumping station on Harcourt Road near the harbourfront to make way for a High Court building. Planners set their sights on the iconic Flagstaff House, a grade one heritage site that now houses the Museum of Tea Ware. But strong public opposition to the removal of a historic 155-metre wall forced the WSD to consider a new target. And so they turned to the Lockhart Road Playground. 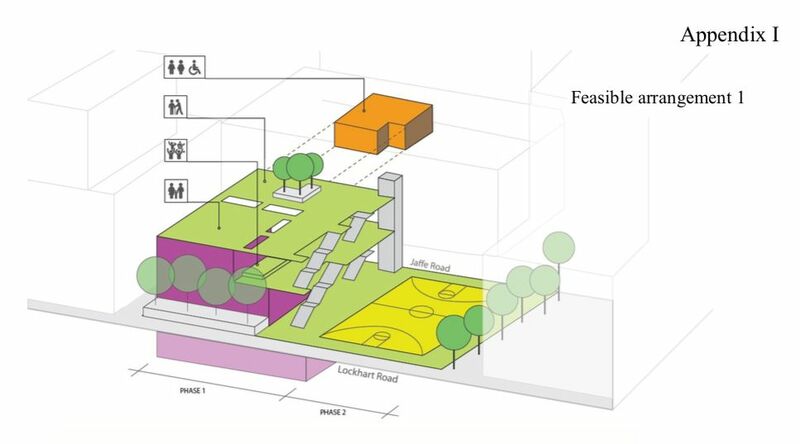 The project, which is set to begin in 2020 and take three to four years to complete, would mean elevating half of the playground to roughly three storeys, with either the basketball court or playing area fenced in on top. The water pumping station would then be built in the space below. Opposition groups say the plan is unacceptable because it encroaches upon public open space. Across the city, redevelopment projects on open spaces have been criticised as unnecessary and costly in already highly urbanised neighbourhoods. In recent years, these proposals have sought to alter public spaces by rezoning them to build large government-backed facilities. Lockhart Road Playground’s basketball court, Wan Chai. Photo: Jennifer Creery/HKFP. 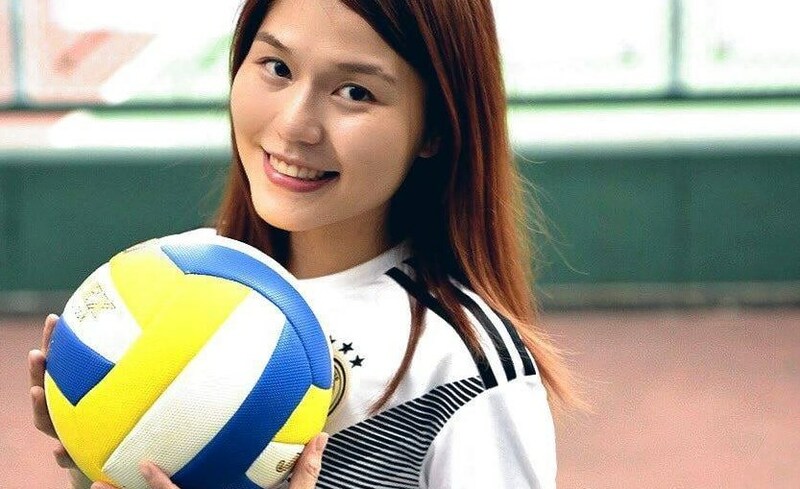 In November, the Finance Committee passed a controversial HK$130 million proposal to turn two volleyball courts at Moreton Terrace in Causeway Bay into a small activity centre. The facility will contain a hall for 250 people and a room for 130 people, with an annual cost of around HK$5 million. Democrats have criticised the project as being too small and costly. 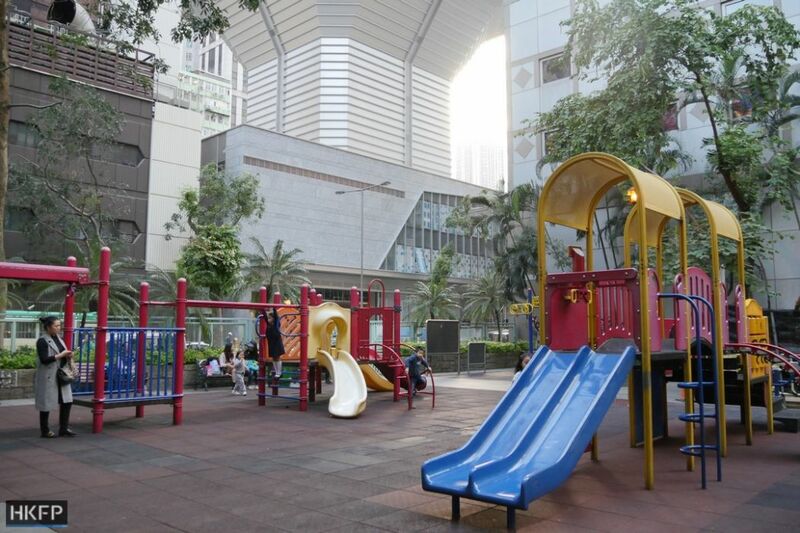 And in 2016, the government proposed to rezone the Tin Chiu Street playground in North Point to make way for a 34-storey housing block, which environmental groups criticised as having the impact of reducing ventilation in a highly developed area. 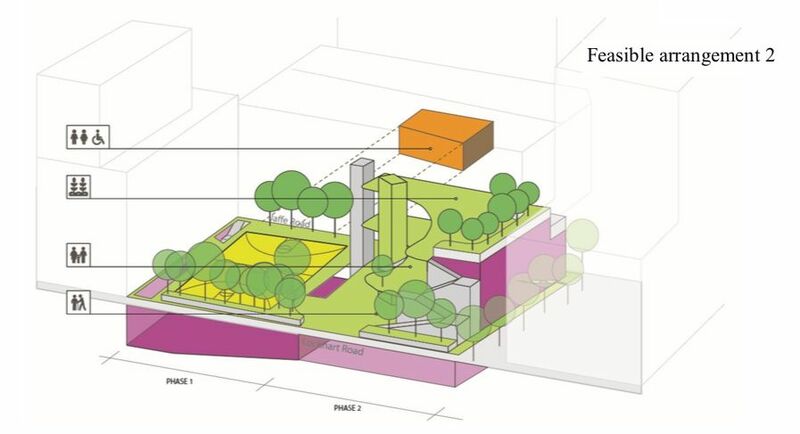 According to the government, the existing site of the pumping station on Harcourt Road was selected as a site for part of the development of the waterfront in the 2011 “Urban Design Study for the New Central Harbourfront” from the Planning Department. In the Chief Executive’s 2017 Policy Address, the area – identified as Site 5 of the new Central Harbourfront – would be designated for the development of a Justicial Complex for the High Court Building to “address the long-term accommodation needs” of the courts. Lockhart Road Playground’s public toilets, Wan Chai. Photo: Jennifer Creery/HKFP. This, critics say, is an unnecessary redevelopment that disguises the WSD’s true intentions. The relocation would mean moving the pumping station from the Central and Western District to another area depleted of space, Wan Chai District. Clarisse Yeung, Wan Chai district councillor. File photo: Facebook. She added that the project would have hefty costs that could otherwise be avoided. In the previous failed plan to relocate the pumping station to Flagstaff House, the government estimated a cost of HK$742.5million. No estimate has been given for the new proposal. But the WSD has said that no feasible alternatives exist in the Central and Western District for the project, adding that other sites proposed by the concern group are unsuitable and that the department would not consider using private land. In the bustling microcosm of the playground, the community has remained largely the same – the main visitors include school children and taxi drivers, who whip in and out of the public toilets en route to their next destinations, while nearby office workers populate the park benches on their lunch breaks to catch the outdoor breeze. The weekend brings groups of domestic workers who line the basketball court with makeshift mats. But the concern group say that the redevelopment plans threaten to disrupt the area’s delicate ecosystem. Mary Mulvihill, another member of the Save Our Urban Parks Alliance, told HKFP that elevating the park area could disadvantage elderly residents or those with mobility issues, who would require lift access. She added that the alternative of raising the basketball court to the third storey instead could lead to a decline in its public use. 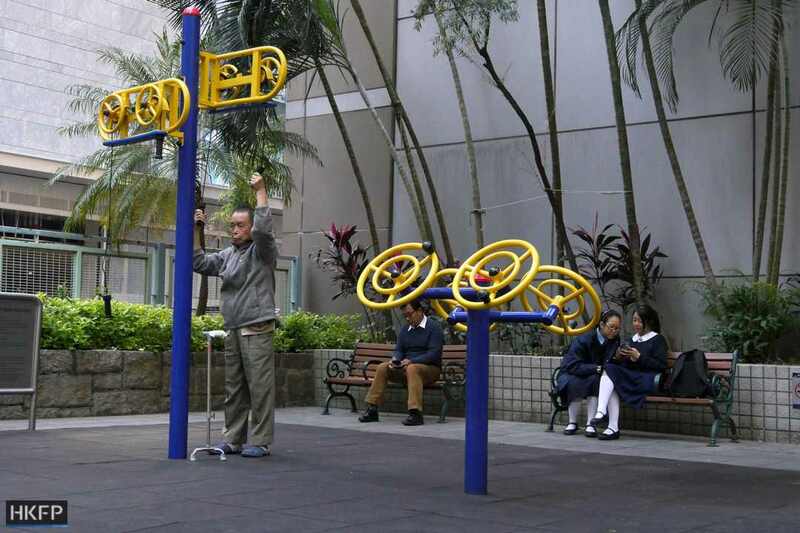 Lockhart Road Playground’s public gym, Wan Chai. Photo: Jennifer Creery/HKFP. This view is not shared by all. 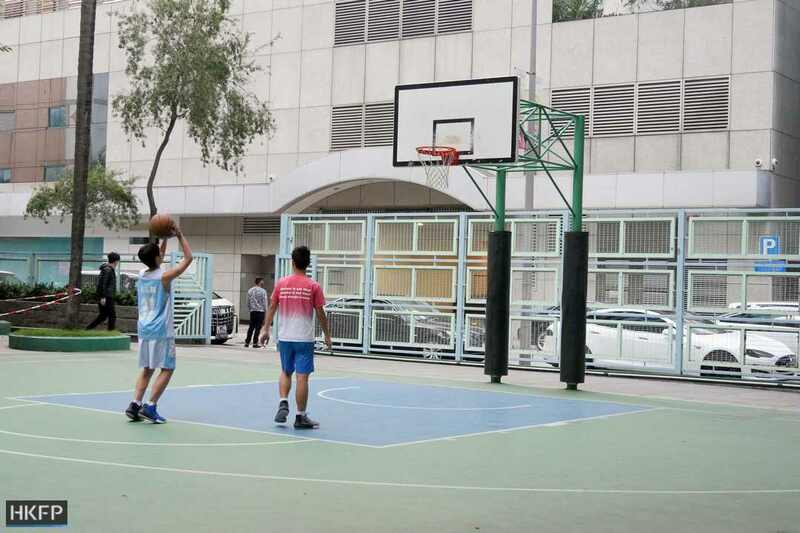 Hagen Arhelger, an investor relations worker and first-time user of Lockhart Road playground’s basketball court, told HKFP that although he was not previously aware of the project, it would make more sense to elevate the basketball court. When asked about mobility access to elevated parts of the playground, the Water Supplies Department told HKFP that there will be barrier-free access, including a lift. A threat to open space? 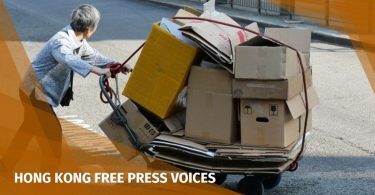 At the core of the debate lies public anxiety over the potential for decreasing open space in Hong Kong. According to government guidelines, the standard provision of open space is a minimum of 2m² per person – 1m² of district open space and 1m² of local open space. A Planning Department spokesperson told HKFP that the project population of Wan Chai District is 184,500, while the area enjoys 56.19 hectares of open space – more than the minimum 20 hectares per 100,000 people recommended by the government. But critics say that the statistics do not reflect the true amount of useable space available to the public. A Civic Exchange study across 18 Hong Kong districts in October said that closer proximity to open spaces likely lowers anxiety in residents, while another survey conducted the year before found that Hongkongers enjoy less than half as much open space as residents of other Asian metropolises, including Tokyo, Shanghai and Singapore. Hagen Arhelger. Photo: Jennifer Creery/HKFP. 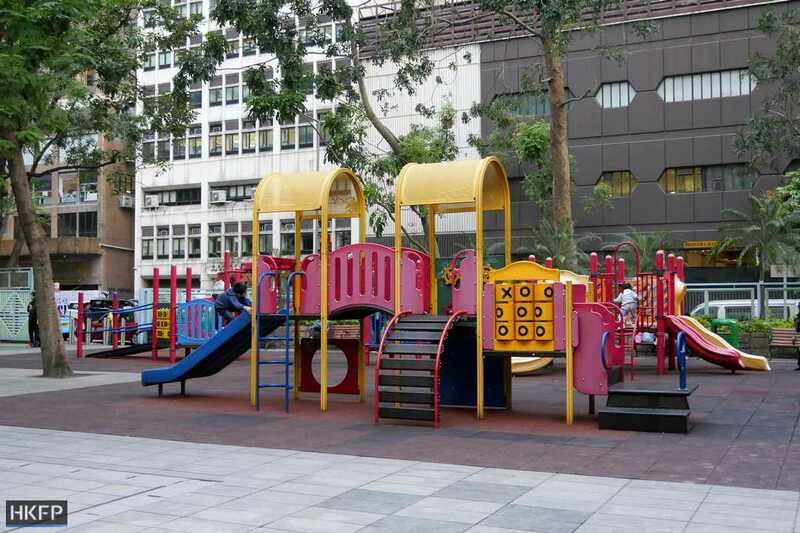 In response to this, Kenny Lee, district councillor of Tai Fat Hau – the constituency containing Lockhart Road playground – told HKFP that she has made a request to the relevant departments that the project does not reduce open public space. “[T]he development of the pumping station on Lockhart Road playground must not lead to an outcome that the area of open space will be reduced, which I find unacceptable,” she said. The concern group, however, might face an uphill battle to generate enough public interest to oppose the proposal. Idy Lee, a stockbroker and Wanchai resident, comes to the playground a few times a week with her daughter. But Lee, 45, told HKFP that it was the first time she had heard about the project. Although she expressed concern over the length of time it would take to redevelop the area, she said she would support the plan as long as it doesn’t reduce the amount of usable space available to the public. “I support [the plan] but I don’t want it to take a long time,” she said. 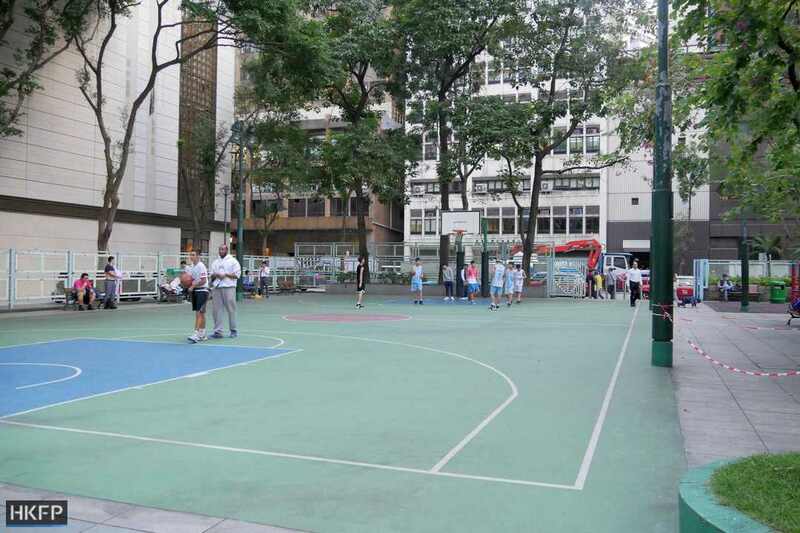 Lockhart Road Playground’s basketball court in Wan Chai. Photo: Jennifer Creery/HKFP. Katherine Limsiaco, a high school student, similarly told HKFP that she was not aware of the project but said that she did not mind it as long as there was enough useable space for the public. Limsiaco, 15, used to visit the playground regularly but now only comes to accompany her younger sister. “A lot of domestic workers come here on the weekend to chill and dance, so there needs to be space for them,” she added. For the district councillor of Tai Fat Hau, this does not mean that residents are not aware of the plans. Lee told HKFP that she conducted a survey of 266 constituents from November last year to January in order to gauge their opinions on new Lockhart Road Playground. “They have not shown strong objections to the proposal. But it doesn’t mean they have no opinions on the proposal,” she said. 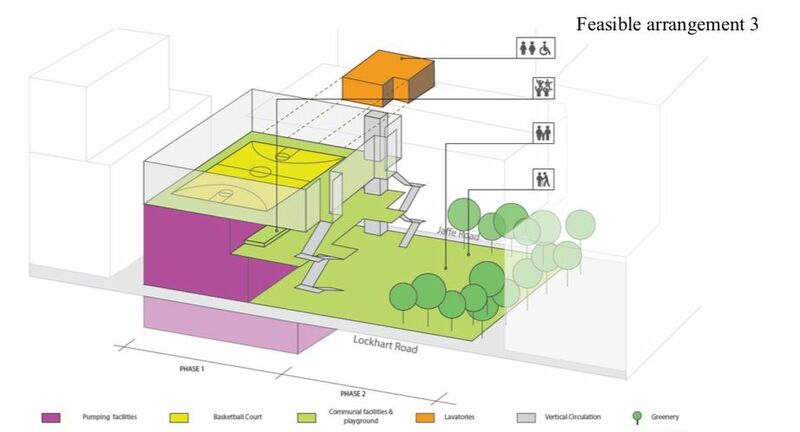 The findings reveal that of those surveyed, the majority – 174 – use the playground for its lavatories, while most respondents requested that the new playground provide rain shelter and include mobility access, at 167 and 165 respectively. 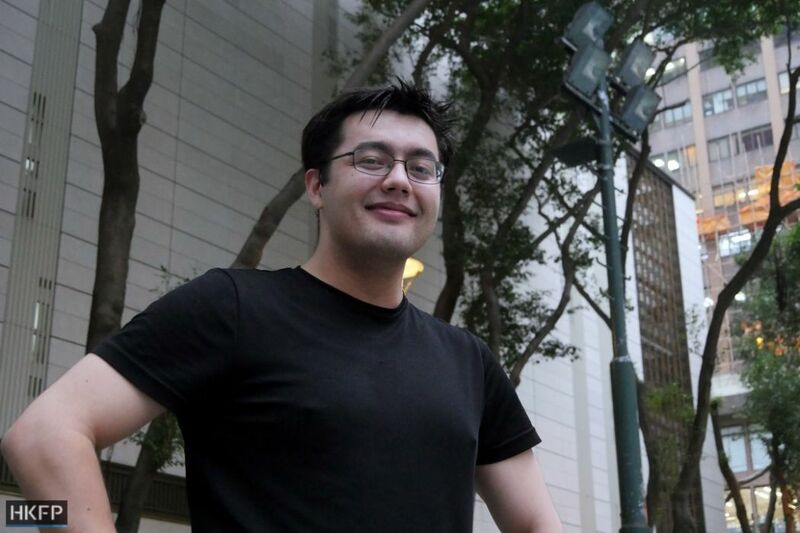 In response to concerns over a lack of public awareness about the proposal, the Water Supplies Department told HKFP that it had taken measures to gather opinions from the community: “We will seriously consider all public opinions collected in formulating the design for the new Lockhart Road Playground for consultation of Wan Chai District Council,” a spokesperson said. If feedback on the proposal is dominated by silence, then Moore and the other campaigners are certainly making noise. But as the tussle over open space in Wan Chai continues, it is clear that it is one that extends beyond the playground.